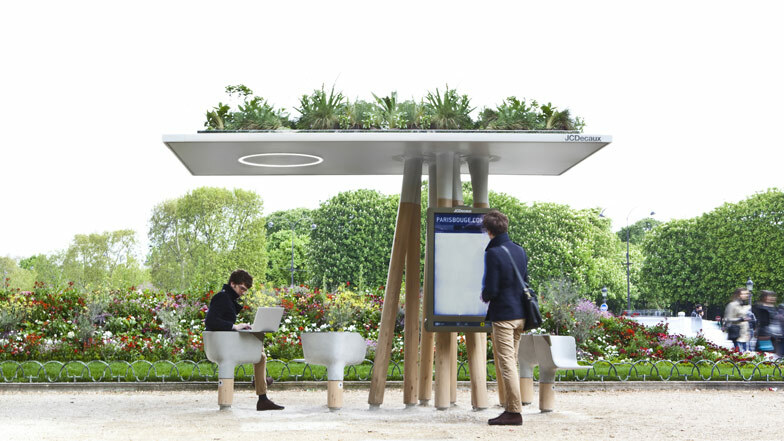 French designer Mathieu Lehanneur has created a series of Wi-Fi stations in Paris where people can sit down to use their laptops or access local information via a large screen. Named Escale Numérique, which translates as Digital Break, the proposal won a competition to design street furniture that links with the underground fibre-optic network so residents and visitors without mobile internet access can connect on the move. Concrete swivel chairs with attached tables for laptops sit underneath a foliage-covered shelter and a large digital billboard provides city information and news for those who don't have a laptop or smartphone with them. A cluster of wooden legs like tree trunks support the green roof, which is designed to look like a garden when viewed from balconies above. The project was realised in collaboration with outdoor advertising company JCDecaux. Photography is by Felipe Ribon. JCDecaux and Mathieu Lehanneur won the call for projects by the Mairie de Paris devoted to intelligent furniture with Escale Numérique, a connected haven of peace available to everyone. For his first urban development project, Mathieu Lehanneur devised a protective shelter with a plant covered roof, like ‘A garden placed on a few tree trunks’ and designed to be as attractive when viewed from the ground as from a balcony. The hard-wearing concrete swivel seats are equipped with plugs and have mini tables attached to rest an elbow, a book or a computer. A large touch screen provides updated information about services in the city: guides, news and augmented reality for tourists and visitors who are not online. Escale Numérique is a forerunner for a new range of urban architecture where virtual reality dictates the shape of what is real in order to live with even greater fluidity.